We, like you, have looked longingly at the Parrot AR.Drone. We've had a lot of fun experimenting with its augmented reality gaming ways and spent a lot of time sighing at its $299 price. Thankfully there's now a much cheaper option -- much less sophisticated, but one that is nevertheless cheaper. 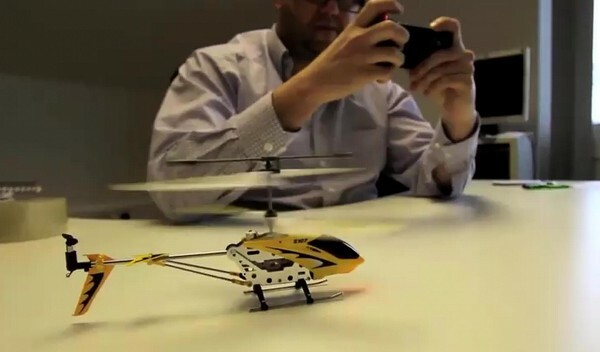 It's the AppToyz helicopter, coming to retail soon and costing a (relatively) affordable £50, or about $80. It looks to be evolved from the standard, tiny, IR-controlled helicopters that are everywhere now, but this one's controlled by your iPhone or iPod touch courtesy of an attachment that clips into the headphone port, much like the suite of universal remote iPhone dongles we've seen over the years. There's also an RC car coming, somewhat more affordable at £30, though only the copter is demonstrated in the video embedded below. Go ahead and watch, and then start eagerly awaiting their release, currently slated for April. AppToyz iPhone-controlled RC car and copter are more reasons to have fun with your phone (video) originally appeared on Engadget on Wed, 26 Jan 2011 13:51:00 EDT. Please see our terms for use of feeds.